Every CoC game has a war weight. It is the composite weight of the defenses and offenses deployed in that player's game. In recent updates, defensive structures and their associated weights have factored more prevalently in the overall calculation. War weight is one of the factors used by the matchmaker to set clans up to battle. A common misconception is that clan wars are matched base by base; that one's "mirror" in the defense rankings is who you were matched up with during the matchmaker/search process. Although SuperCell has never provided the details around the matchmaking algorithm, they've told us enough that we know this is not true. A clan's total war weight is used to find a match, along with some additional magic around what's ranked at the top of the game. Some particularly clever players have figured out that they can design games in such a way as to lower their clan's war weight while still bringing a superior offense to the match up. In short, they engineer an upgrade path that maximizes offense over defense and avoids using key defensive structures that are known to carry a lot of war weight (x-bows, infernos, eagle artillery). The most basic form of this is the X.5 game. These players upgrade their game to, say, TH9 and do not drop x-bows until everything else is maxed, or TH10 with no infernos, or TH11 with no eagle artillery. The more devout among them will not drop ANY new defenses (including things like archer towers, wizard towers, etc) until they have everything upgraded, especially defense. This has the net effect of keeping their individual war weight low when compared to others with all new defenses in place; enough so that they could just as easily be a full town-hall level lower in comparative weight. The defenseless game goes one step further by eschewing all but the most rudimentary of defenses (usually traps). These games will have war weights equivalent to three or more town-hall levels lower. Then you have the mini-max game that uses some defenses but not many, and ranks somewhere in between. In each case, the player focuses game development efforts on offense; in particular, troops, spells, and heroes. To recap - low individual war weight with significantly limited defense but strong offense, which means a lower overall clan war weight. Why would this be a problem? Well...your "typical" player does not play the game like this at all and lots of clans are comprised of players with maxed, rush, and otherwise wholly deployed games. (In other words, most of us drop everything new as soon as we can and upgrade like crazy.). These games do not optimize deployment and upgrade of defenses to achieve lower individual war weights, so they actually have higher individual war weights than engineered games...as much as one to three town-hall levels higher! Remember how I said that clan wars matchmaking uses the total weight of your clan? If you have a clan with a bunch of players who have engineered their games for low defense/strong offense, they will have a combined war weight that is low. The matchmaker will try to find a clan with a similar combined war weight, further extending the net as time goes on (loosening the acceptable matching war weights). This is how mismatches occur. Think about the clan of "normal" players; games that are not engineered. Their individual bases will have higher war weights than the engineered games, leading to a higher overall, clan war weight. If/when they get mismatched to the engineering clan, they find themselves up against a clan with top players who are defensively out of their reach and bottom players whose bases are easily destroyed but who have the ability to reach up and three star even their strongest players. All is not lost, however. These clans with heavily engineered rosters do not typically bring great attackers with them. In fact, they're usually poor attackers. Even with stronger offensive lineups, they fail to translate their advantages into stars, frequently attacking weaker players. 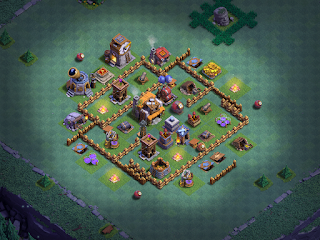 Their bases are also often easily three starred by regular players attacking UP. Is it tough to beat a clan with a heavily engineered clan wars roster? Sometimes...sure. More oft than not, I find that these clans are actually weaker than they look (bark is worse than their bite). There are two sides to roster engineering - those who do it for a better match but are poor attackers, and those who really know their stuff. There are far, far fewer of the latter than there are of the former. This is why I always encourage clans who find themselves in the underdog position to still get in and battle with all they’ve got. If your clan has good attackers, you stand a very good chance of pulling out a win. All of that said, the question remains - is engineering truly bad for the game? The answer - it depends on the how SuperCell balances things out. Although extreme engineering (defenseless. some mini-max) is certainly an example of how far some people will go to get a favorable clan war match-up, the real scourge of clan wars matchmaking is the X.5 game and it is far more prevalent than other forms of engineering as it has been used in war roster engineering for a very long time. These games are roughly the equivalent of their lower town-hall selves in war weight but with their higher town-hall level offensive capabilities. Sufficiently advanced in their development, they become a game that even maxed town-hall players one level below have difficult achieving better than a two star win upon them. Recent changes to the clan war matchmaking algorithm has dug a bit into the X.5 game; there are many complaints on the forums from these players, saying they are no longer pulling in the easier clans but instead getting matches with rosters that are more closely matched to their actual TH level. Those who are earlier in the X.5 development process still seem to be getting the more favorable match-up. That’s how it should be; once a player’s game gets out of reach of the lower town-hall level, he SHOULD be pulling in others who are further along. But how can the matchmaker achieve this kind of balancing? Defenseless and mini-max games are more difficult to ferret out because they’re embedded with normal, every day players who may APPEAR to be engineering their games when they’re really just rushing or trying to upgrade/add as they get resources. Some have suggested a base war weight, determined by town-hall level; others suggest increasing weight on troops and/or offensive structures like the laboratory, spell factories, and barracks; some suggest focusing on the hero levels; while still more folks suggest a combination of these ideas. In the end, it’s a tough call for SuperCell who needs to balance playability with an equitable experience all while not causing a ripple effect in the matchmaker that throws it all into chaos. The bright side - SuperCell has been very open about this topic. They refer to these extreme engineering games as “lopsided” games, likely in an effort to separate the good from the bad. They’ve also been very clear that, in their awareness of the issue, they are working on ways to even things up in wars so all have a reasonably fair match-up. We all know that the matchmaker isn’t perfect; there WILL be mismatches, and there is always an underdog. The goal is to make it so mismatches are less common and the underdog stands a chance of pulling the upset. As players, we just have to wait patiently while SuperCell tweaks the system.